There are things we do every day in Howard County that we never give a second thought to. Then there are once-in-a-lifetime events that we swear we'll never forget. While the identities of supporting players fade with time, it's important to recognize that we rarely act alone in life. At our best (and at our weakest) there are always others laboring nearby or behind the scenes to keep all the wheels turning in our communities. Sometimes we are the toilers; other times, the beneficiaries. As part of our annual women's issue, the staff of Howard Magazine chose 10 women whose efforts away from the spotlight earn much praise but little recognition. Every day they work hard to make Howard County a better place to live and while you may not recognize their names, we're guessing at least one of these women has had an impact on your life. Actions speak louder than words, and in the world of politics, voting records often tell a different story than campaign promises. 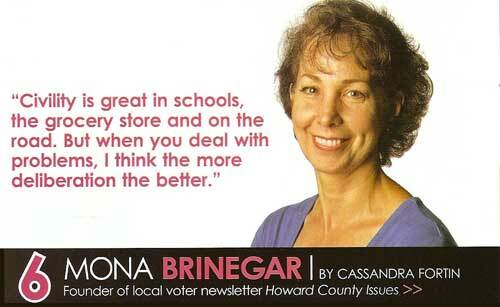 Mona Brinegar wants voters in Howard County to be well-informed about who is representing them locally, so she created a quarterly publication and companion Web site to serve as a clearinghouse for all the informaiton residents may need. With a circulation of 10,000, Howard County Issues and www.howardcountyissues.org keep voters up-to-date on everything from upcoming meetings to voting records. It also gives them a forum to ask quesions and express opinions. "I wanted to give people a place to voice their opinions...and I want to help people realize how important local issues are," says Brinegar, a systems analyst who lives in Ellicott City. "We all know who Hillary Clinton and Barack Obama and John McCain are, but we need to know the people we are trusting to represent us locally, too." Providing useful, easy-to-understand information is the bottom line for Brinegar, because a well-informed voter makes wise choices - and is more likely to be vocal. "I love democracy. I love that we can be so outspoken," she says. "Civility is great in schools, the grocery store and on the road. But when you deal with problems, I think the more deliberation the better." Brinegar, one of 35,000 Independent voters registered in Howard County, says high on her list is making it clear for her readers which elected officials are working for the whole constituency and not for special interests. "I don't care if a politician votes against me, as long as he votes for another Jane Doe and not just the people who give him money," she says. "I want everyone to be treated equally, and I won't stop until it happens."